【待译】What is the DIKW Pyramid? Ontotext>Knowledge Hub> What is the DIKW Pyramid? Knowledge Pyramid, Wisdom Hierarchy and Information Hierarchy are some of the names referring to the popular representation of the relationships between data, information, knowledge and wisdom in the Data, Information, Knowledge, Wisdom (DIKW) Pyramid. Like other hierarchy models, the Knowledge Pyramid has rigidly set building blocks – data comes first, information is next, then knowledge follows and finally wisdom is on the top. Each step up the pyramid answers questions about the initial data and adds value to it. The more questions we answer, the higher we move up the pyramid. In other words, the more we enrich our data with meaning and context, the more knowledge and insights we get out of it. At the top of the pyramid, we have turned the knowledge and insights into a learning experience that guides our actions. So, let’s have a look at the individual components of the Knowledge Pyramid and how we move from one to the next. Data is a collection of facts in a raw or unorganized form such as numbers or characters. However, without context, data can mean little. For example, 12012012 is just a sequence of numbers without apparent importance. But if we view it in the context of ‘this is a date’, we can easily recognize 12th of January, 2012. By adding context and value to the numbers, they now have more meaning. 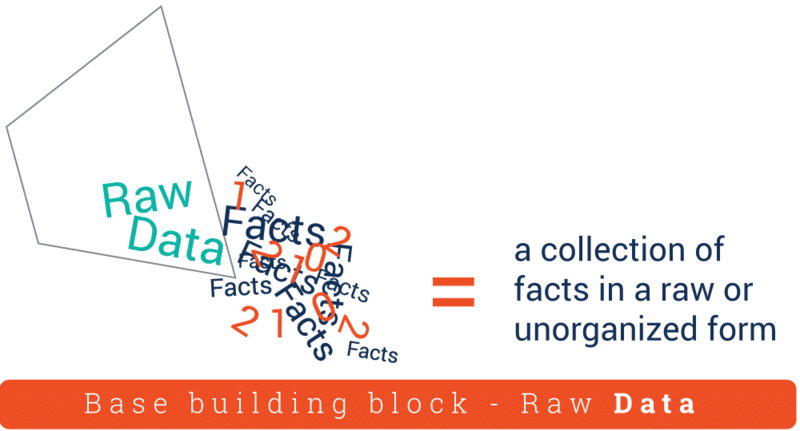 Information is the next building block of the DIKW Pyramid. This is data that has been “cleaned” of errors and further processed in a way that makes it easier to measure, visualize and analyze for a specific purpose. Depending on this purpose, data processing can involve different operations such as combining different sets of data (aggregation), ensuring that the collected data is relevant and accurate (validation), etc. For example, we can organize our data in a way that exposes relationships between various seemingly disparate and disconnected data points. More specifically, we can analyze the Dow Jones index performance by creating a graph of data points for a particular period of time, based on the of data at each day’s closing. By asking relevant questions about ‘who’, ‘what’, ‘when’, ‘where’, etc., we can derive valuable information from the data and make it more useful for us. “How” is the information, derived from the collected data, relevant to our goals? “How” are the pieces of this information connected to other pieces to add more meaning and value? And, maybe most importantly, “how” can we apply the information to achieve our goal? When we don’t just view information as a description of collected facts, but also understand how to apply it to achieve our goals, we turn it into knowledge. This knowledge is often the edge that enterprises have over their competitors. As we uncover relationships that are not explicitly stated as information, we get deeper insights that take us higher up the DIKW pyramid. But only when we use the knowledge and insights gained from the information to take proactive decisions, we can say that we have reached the final – ‘wisdom’ – step of the Knowledge Pyramid. Wisdom is the top of the DIKW hierarchy and to get there, we must answer questions such as ‘why do something’ and ‘what is best’. In other words, wisdom is knowledge applied in action. We can also say that, if data and information are like a look back to the past, knowledge and wisdom are associated with what we do now and what we want to achieve in the future. One easy and fast way for enterprises to take the steps from data to information to knowledge and wisdom is to use Semantic Technologies such as Linked Data and Semantic Graph Databases. These technologies can create links between disparate and heterogeneous data and infer new knowledge out of existing facts. Armed with this new knowledge, enterprises can climb up the mountain of wisdomand gain a competitive advantage by supporting their business decisions with data-driven analytics.